First, toast the oats. In a large skillet over medium heat, melt the butter. Add the oats and toast - stirring often - for about 2 minutes until fragrant and lightly browned. In a medium saucepan over medium heat, bring the water and milk to a high simmer (just beneath the verge of boiling). Stir in the oats. Reduce the heat to medium-low. Cook for 25 minutes - stirring no more than once every 5 minutes. Stir in the brown sugar and salt. Continue cooking - stirring often - for 10 more minutes until most liquid has been absorbed and the oatmeal is thick and creamy. Remove from heat. Let set 3 or 4 minutes. Transfer to serving bowls and top as desired. This recipe is easily doubled. Just multiply all ingredients by two, except for the butter (1 Tablespoon should be fine to toast a full cup of oats). After cooking the oats for 25 minutes, you might start to think the oatmeal won't thicken correctly. Don't worry. It will start to achieve an oatmeal consistency during the final 10 minutes and the few minutes when you let the oatmeal set. Our definition of steel-cut oatmeal includes the lightest pop or crunch left in the oats. 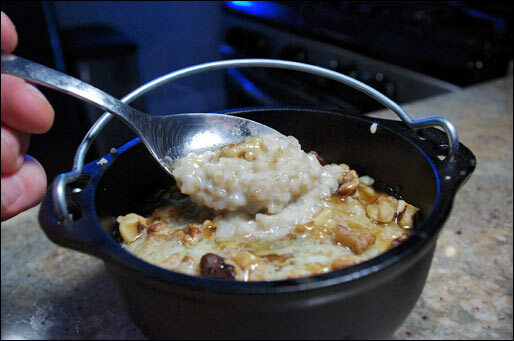 If you like a more mushy consistency, just cook the oats 5 minutes longer. They take longer to make, but most people agree that steel-cut oats make a more satisfying oatmeal than instant or Old Fashioned Oats. Lightly toasting the oats brings out their natural flavor which is nutty and reminiscent of butterscotch. Recipe number 3079. Submitted 12/22/2011.